Spruce up your summer salads with sweet & juicy Jerte Picota Cherries! Make this salad a main by adding shredded chicken! 1. For the vinaigrette, place the cherry juice into a small pan and heat over a medium heat. Let the juice reduce by half. 2. In a small bowl add the balsamic vinegar, crushed garlic, honey and reduced cherry juice. Whisk together and slowly add the olive oil, season to taste. 3. 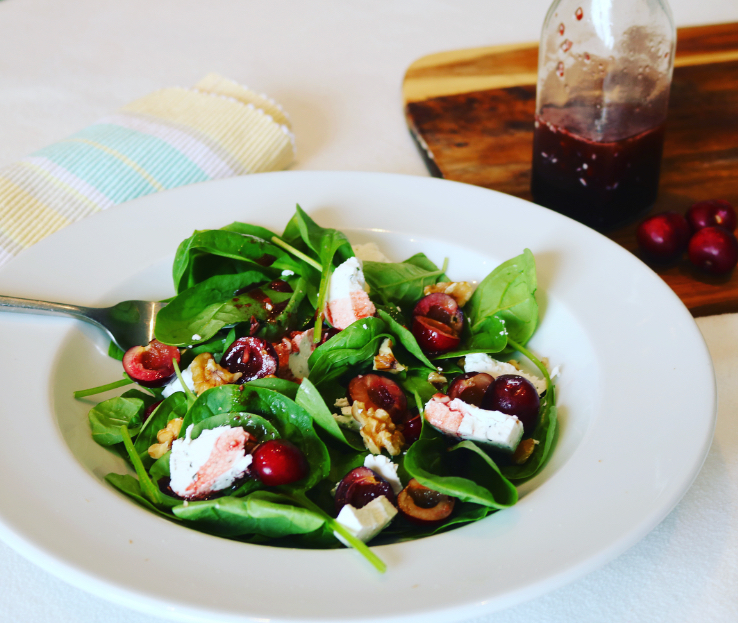 For the salad, share the spinach between four plates, spinkle over the Jerte Picota cherries, goats cheese and walnuts. Then drizzle over the cherry balsamic vinaigrette. Enjoy! Why are Jerte Picota cherries so delicious? · The Jerte Picota Cherry is a special variety of cherry that is native to the beautiful Jerte Valley in Northern Extremadura, Spain, 200km west of Madrid. This area is famous for the incredible cherry blossom of more than a million trees that takes place each year. · It is a 100% natural product that follows a natural growing season, which is why the arrival of the Jerte Picota Cherry changes each year and why they are only available for six weeks each summer. · When the cherries are ready to be harvested at optimum ripeness, they are hand-picked off the trees, leaving the stalks behind, and placed into chestnut baskets. This is why they are sold without a stalk. · Jerte Picota Cherries are usually available from the end of June until the beginning of August in the UK, and they are expected to arrive in stores from the beginning of July, due to the cold winter this year. · The Jerte Picota Cherry are a P.D.O. Product (P.D.O. standing for Protected Designation of Origin) which certifies that the fruit has been grown, harvested and packed under rigorous quality-controlled procedures and has come exclusively from the Jerte Valley in Spain. · The Jerte Picota is not only unique from its P.D.O. status but also from its stalkless harvest and its shape, which has a slight peak to the base, hence the word ‘Picota’ means ‘peaked’.